The objective of this exercise is to demonstrate how many self-defense options we still have when we do not have the option to use one or more of our limbs. Perhaps your arm is in a cast; or you are being grabbed or restrained; or you get around in a wheelchair; etc. What’s Free, What’s Open is one of the core concepts of physical self defense. Requirements: Two instructors. About 5 minutes. With your wrist still being grabbed by your co-facilitator, ask the participants, “what do you think would happen if, instead of pulling away, I step into my ready stance toward the grabber?” Do it. Solicit participants’ observations, which may include: catching the grabber off guard, weakening the grabber’s grip, improving the grabbee’s balance and leverage, and generally shifting the power dynamic. Step out of ready stance. With your wrist still being grabbed by your co-facilitator, let the participants know, “it’s easy to get caught up in the moment and zero-in on the limb being grabbed. Instead of focusing all our attention on that wrist, call out the tools on my body that are still free and available to use as weapons.” This list can include: other hand, other elbow, both feet, both legs, teeth, voice, brain, ability to think and reason, fabulous negotiating skills, etc. Demonstrate telling your co-facilitator to let go of your wrist. The co-facilitator should then respect that boundary and let go of your wrist. This often elicits chuckles from participants. Sometimes, we forget that simply stating what we want can be successful. Have your co-facilitator grab your wrist again. This time, ask the participants to identify what is open on the grabber’s body for the grabbee to strike. This list can include: feet, knees, groin, torso, throat, nose, eyes… pretty much everything. Point out that the grabber and the person being grabbed might now be pretty equally matched: they each lack the use of one hand, and if the grabber wants to regain the use of their hand, they will need to let go. You can demonstrate again by using a variety of different grabs, such as a headlock, being pinned to the ground, etc. 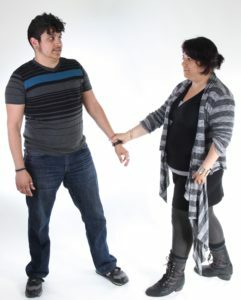 Remember, the point of this exercise is not about practicing getting out of a specific grabs, but rather to practice the concept of “What’s Free, What’s Open.” “What’s Free, What’s Open” can be applied to any type of situation when self-defense is needed, such as being able to leave an abusive home.